Excel 2016 is out and works better together with Power BI! Microsoft recently announced the availability of Office 2016. If you’re already working in Excel, you no longer have to look up your workbook from Power BI. We’re excited to announce that you can now effortlessly publish your workbook content to Power BI, directly from Excel 2016! Don’t have Excel 2016 yet? Check it out. Once your workbook is published, you can keep working on it in One Drive for Business. Power BI automatically refreshes when you make updates to your workbook! 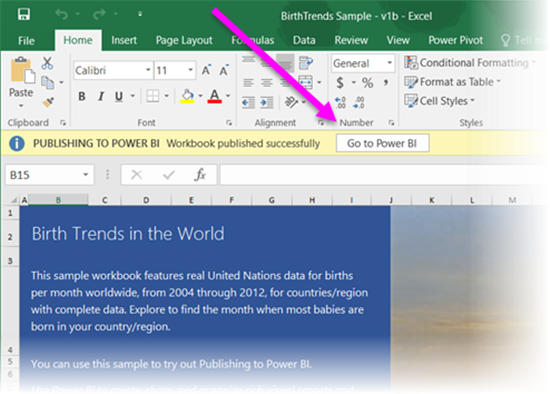 To publish your Excel workbook to Power BI, simply select File > Publish. Excel logs into Power BI with your current account. 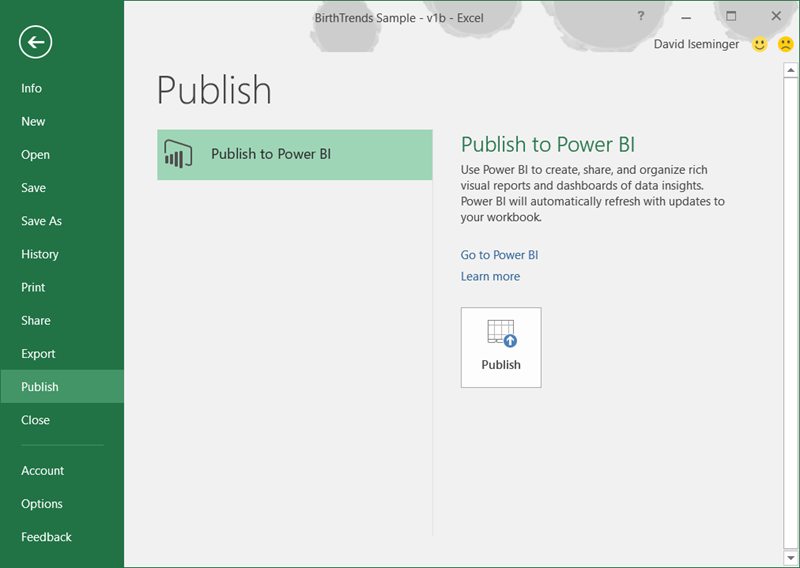 If you have a Power BI account, you are ready to go. If you don’t have a Power BI account, you can sign up for Power BI. Excel displays the progress of publishing to Power BI, as shown in the following image. When complete, it displays a message box that you can select to view the published data and reports from your workbook in Power BI (Power BI loads in your default browser). You can continue working in the Excel, and updates will automatically occur in Power BI according to the default refresh settings policy in Power BI. In Power BI, you can select Reports, then the file name you uploaded (in this case, BirthTrends Sample) and view the Power View visualization of the Excel report in Power BI. In addition, supported data is available for you in the Datasets section (In this case, BirthTrends Sample). Note: Publishing from Excel to Power BI requires the workbook to be saved in OneDrive for Business. If your workbook is not saved to a OneDrive for Business account, publishing to Power BI will guide you through the process of uploading to OneDrive for Business, then publishing to Power BI. 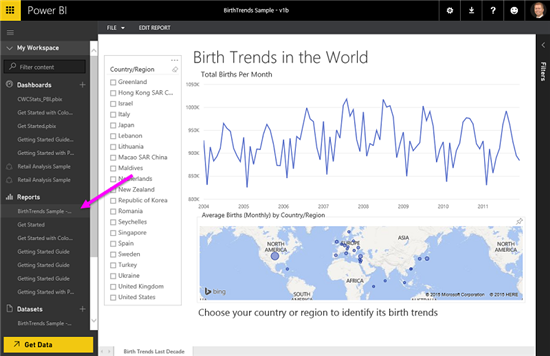 Try it out today with a self-guided interesting sample of birth trends data. Click for more details and additional resources.